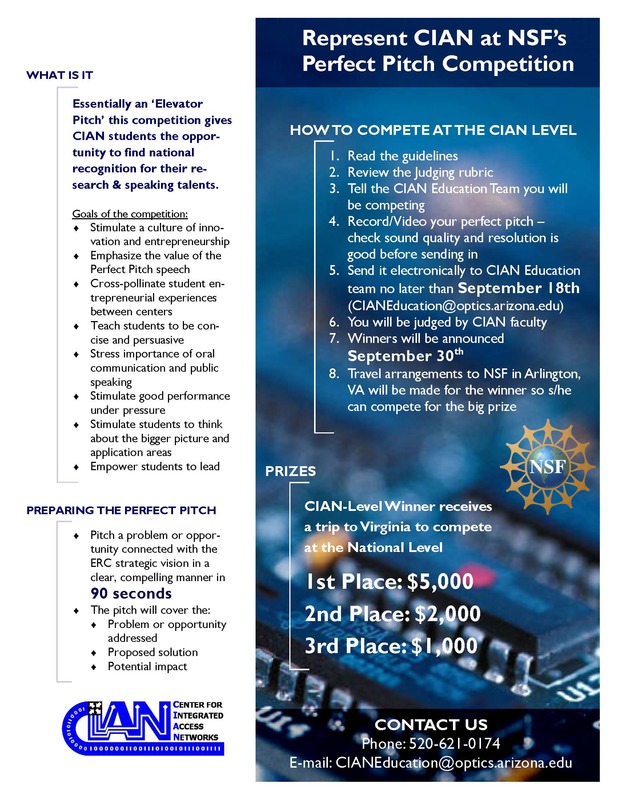 Perfect Pitch Competition – CIAN Accepting Entries! Participate in the Perfect Pitch competition for the chance to be awarded $5,000 for a 90 second “Elevator Pitch.” Submission should be made via email in the form of video recordings (cell phone videos with good quality are accepted). Please do not hesitate to email or call with any questions. Currently CIAN-funded students are eligible. Find out more about the guidelines and judging rubric. Click the image to see the flyer full-size. This entry was posted in Education, Industry & You, Research and tagged CIAN Students, education, Perfect Pitch, professionalism, video. Bookmark the permalink.